The Kopernik Astronomical Society (KAS) is always interested in getting new members of all levels of background and interest in Astronomy! We believe in letting members pursue their interests in Astronomy at whatever level they may be interested in. We have members who are theory people, star gazers, or dedicated observational astronomers. 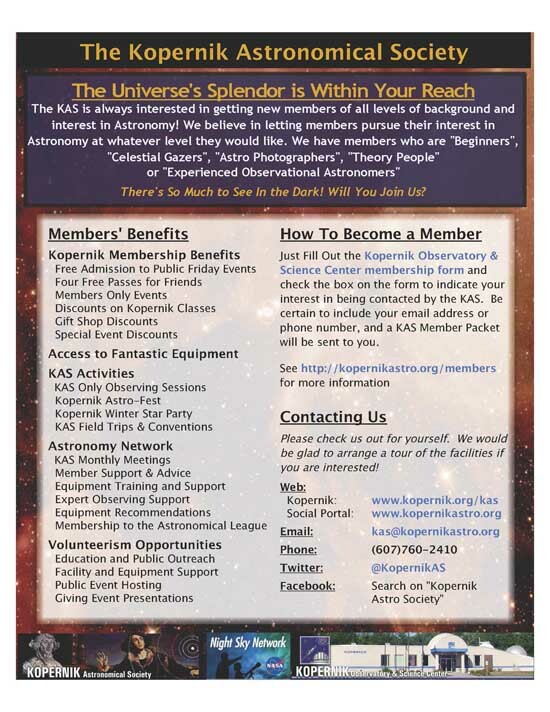 Perhaps the unique thing about the KAS relative to other Astronomy clubs is our interest in supporting the science educational programs at Kopernik Observatory & Science Center. As such, visitors will often find KAS volunteers helping at Kopernik programs, or even running the program completely. In addition to astronomy, many of members share interests in related fields such as amateur radio, science fiction, space science, spaceflight, and collecting meteorites. We welcome you to visit the KAS, meet our great club members, get a tour of the observatory, and join us in any way you may want to engage in the great adventure of astronomy.